*some links are affiliate, and we deeply appreciate your support. This One Summer remains, hands down, one of my favorite graphic novels, and I finally convinced Rikki to read it! The story focuses on the friendship of two girls at their annual summer vacation spot as they come of age. The story mixes in family drama, the awkwardness of being on the cusp of the teenage years, friendship, growing pains, and the complexity of inner life. Some panels are heart-stopping in their elegant blending of text and art to create something meaningful. I especially love how the concept of memory was handled, but it captured so many hard to define emotions so, so beautifully. It embodies my favorite moods of bittersweet and nostalgia, and I haven't ever seen this level of layering in a graphic novel, which makes it extra special. Okay, enough gushing. On to the dinner! 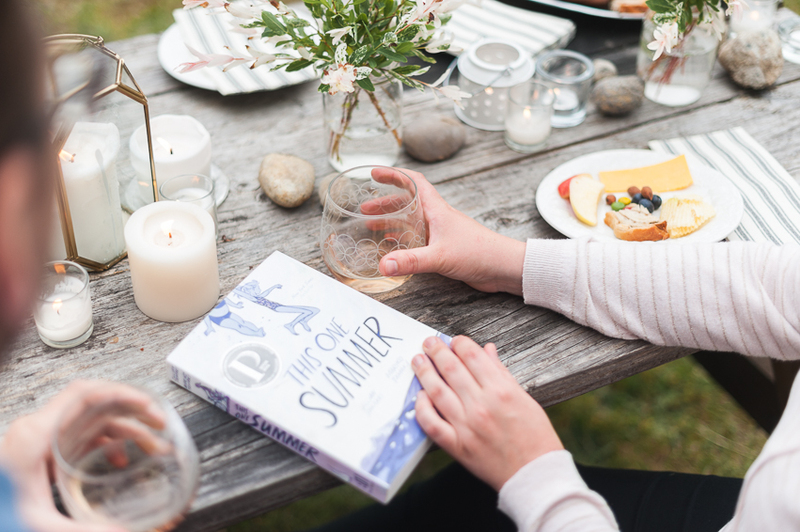 The novel is set at a vaguely rural lake house, and most of the outside scenes are of beaches, family BBQ's, swimming, and the girls walking through the forest. 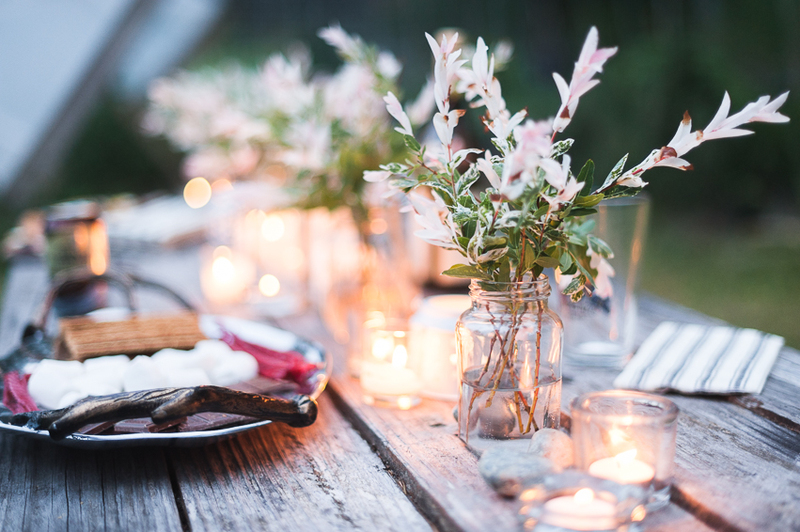 Because the setting is so natural and un-fussy, we simply cut some of Rikki's dappled willow in her yard, stuck the branches in mason jars, and lined them up along the length of the table. We love how they look floral, but aren't. Also, the collection of pebbles play a big role visually and thematically in the book, so rocks on the table were a must. Candlelight was another must, as many scenes include candles, or outside fires, so we wanted to represent that on the table. Place settings were kept intentionally neutral, highlighted with striped paper napkins to match the aesthetic of the novel. Junk food is central to the novel. The girls visit a convenience store, where a lot of the plot is set in motion, to buy snacks for their horror-movie binging. We played with our usual format of charcuterie boards, but instead of fancy ingredients, used junk food and our favorite camping foods. We honestly love the juxtaposition of the elegant and the fun, and this appetizer board was a hit with our kids. Of course there was wine! All the adults in the novel are pretty much constantly imbibing wine or beer, and we loved the label on this one for our dinner with it's plants and bugs; so fitting. 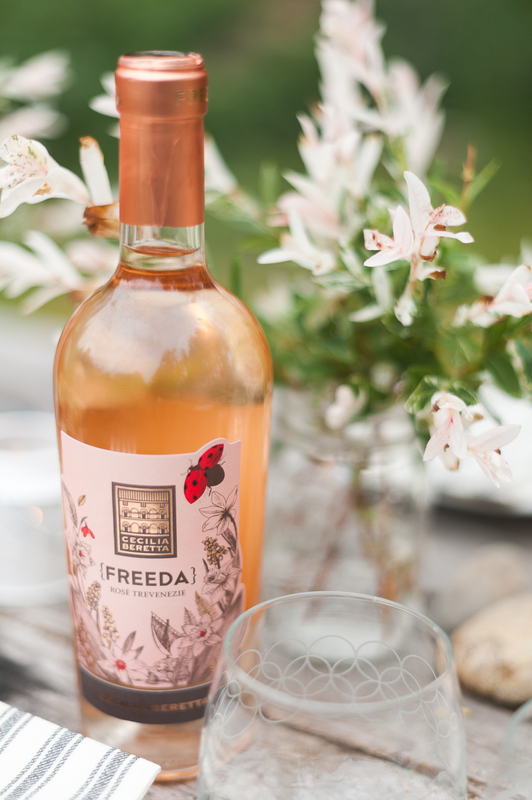 We think a chilled rosé is the perfect summer wine, don't you agree? As we discussed the novel, we brought out more fun food. 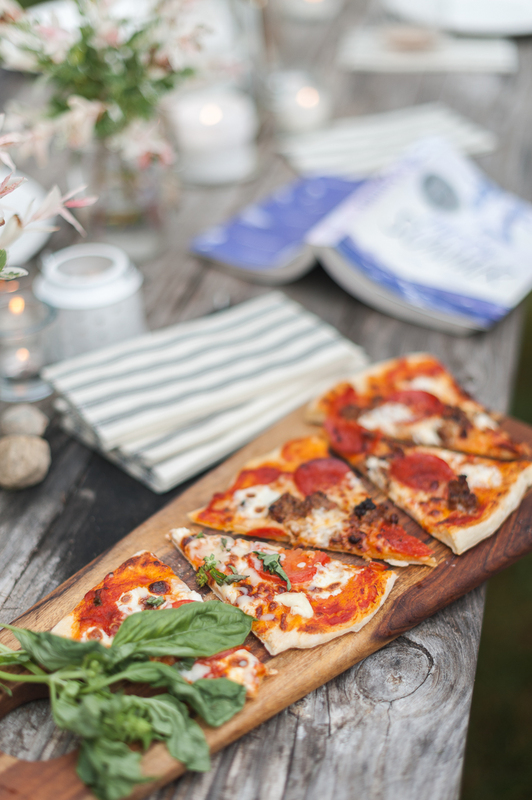 Honoring the recurring BBQ's in the novel and the fact that pizza is a perennial favorite of teens everywhere, we broke out the pizza stone and baked ourselves some deliciousness. Rikki made the pizza dough from scratch, nailed simple sophisticated toppings, and got the perfect amount of bubble and char on the crust. It was just absolutely delicious and fitting. S'mores were specifically focused on in one of my favorite scenes, and so while we were finishing dinner, we got a fire started, then broke out the supplies (and Twizzlers, which are repeatedly mentioned) and toasted some marshmallows. It was my 4.5 year old's first time making them and he was completely delighted. Everyone was relaxed and happy, finishing off drinks, casually chatting, and helping the kids assemble their s'mores. It was truly a perfect reflection of the book's overarching theme of family. It gets dark pretty late around here, but when the sky began to deepen, it also deepened the beauty of our tablescape. It was a fitting end to the night; the dramatic backdrop enhancing the effects of the warmth of good conversation with friends and nostalgic food. Another beautiful summer night talking books and enjoying good company. These are the days. A Christmas Carol was a wonderful seasonal buddy read for us. 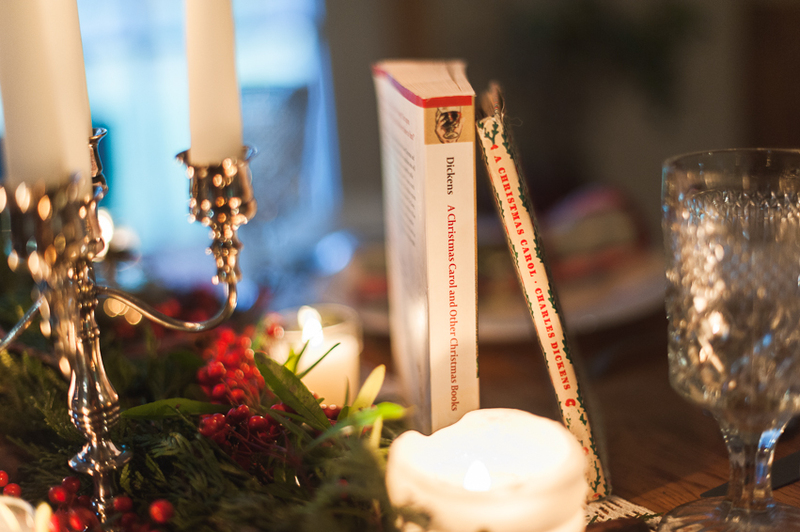 Short and sweet, and the perfect way to get back into our literary dinners since Rikki's baby arrived. 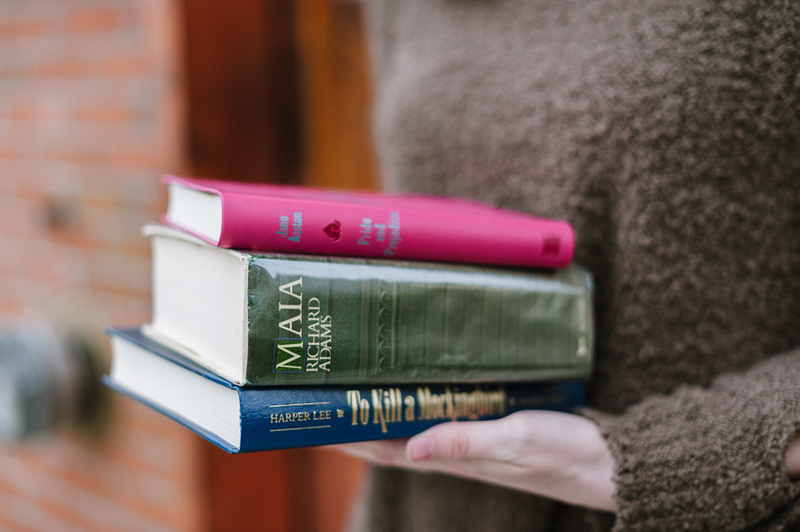 Our reading lives have been up and down the past few months, full of too many good books to choose from, and often choosing family over everything else, as the season demands. 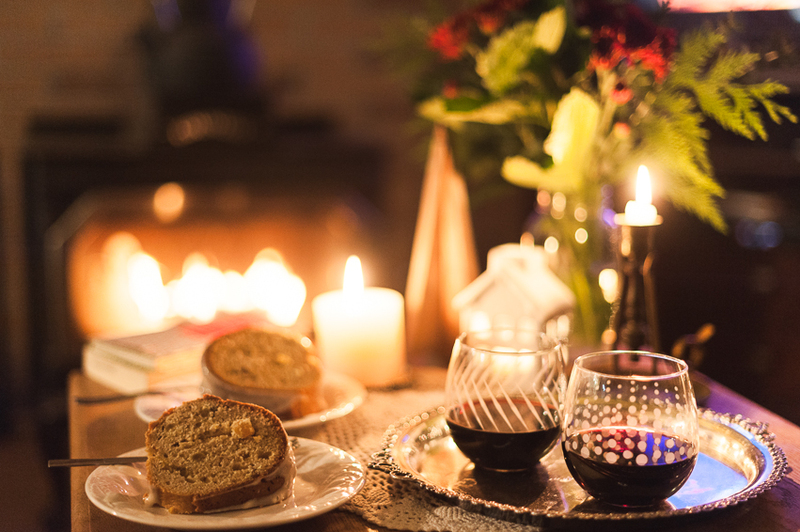 This dinner party brought both of our families together and made for a great night of conversation, simple yet delicious fare, and warm, flavorful mulled wine. 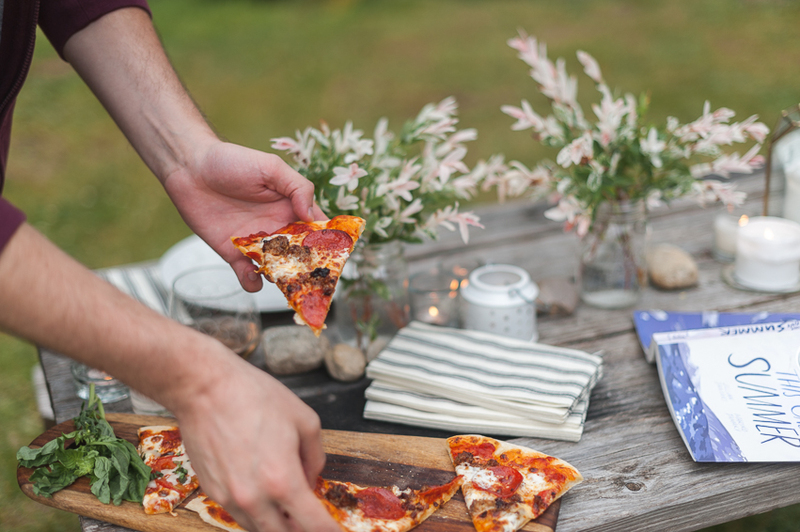 As with many of our dinner parties, we went with a simple meal and set-up; the goal is to enjoy ourselves, not work all night long. Using lots of candles we had on hand, a garland of greenery (Trader Joes's for the win!) and berries cut from the backyard, we laid down a base over a lace piece Rikki had. 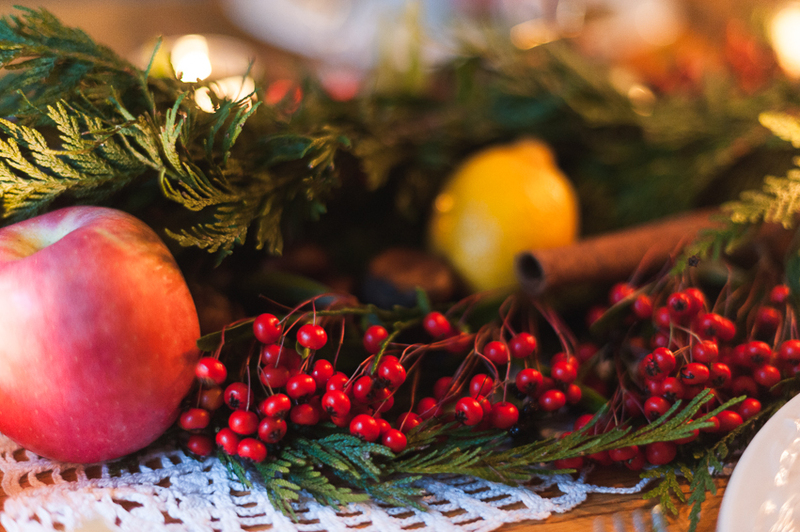 We then sprinkled in fresh citrus, apples, cinnamon sticks, and chestnuts, which were all mentioned in the novella, and stuck a candelabra in the center. It ended up feeling SO warm and inviting! Everyone was kind of lingering near it, because it was so pretty and cozy. The place settings were just Rikki's dishes and silverware mixed with some napkins in rings that Michaela had on hand that felt Christmassy enough. Honestly, it took us ten minutes to lay down and tweak to our satisfaction, and cost about $10. 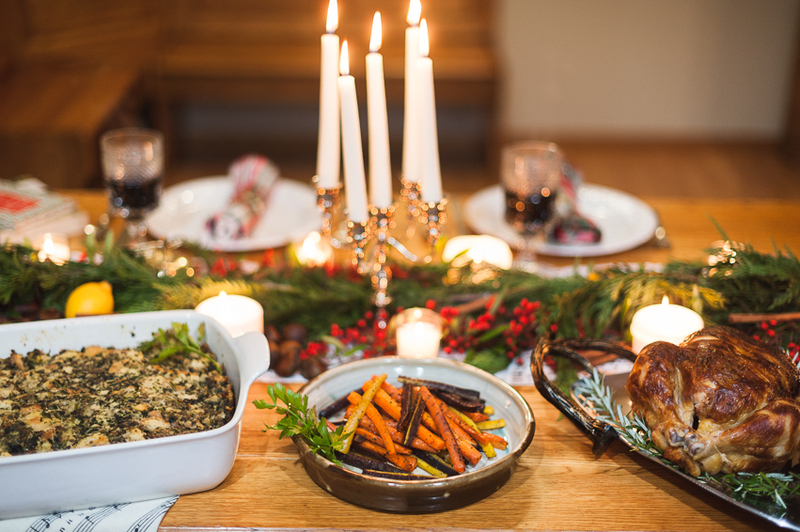 Keeping in mind the Christmas party scene at Scrooge's nephew's house, we brought to life a scene with lots of candles, rustic, seasonal touches, and simple hearty foods. It felt really good to return to vintage Christmas staples and create a classic setting in the midst of our modern holiday. With two roast chickens, glazed carrots, and a beloved family dressing recipe, dinner was ready to go! It fed five adults and three kids perfectly, so we were able to sit and enjoy the meal and good conversation while we sipped warm mulled wine and relaxed together. We went with a homemade wonderfully spiced rum raisin cake for our dessert. The novella mentions a Victorian twelfth cake, which is a really similar concept; heavy on eggs, light on sugar, spiked with alcohol, and studded with fruits and nuts in a dense cake. We toasted to the night, finished off the food and wine, and enjoyed the warm fire while visions of A Christmas Carol danced in our heads. 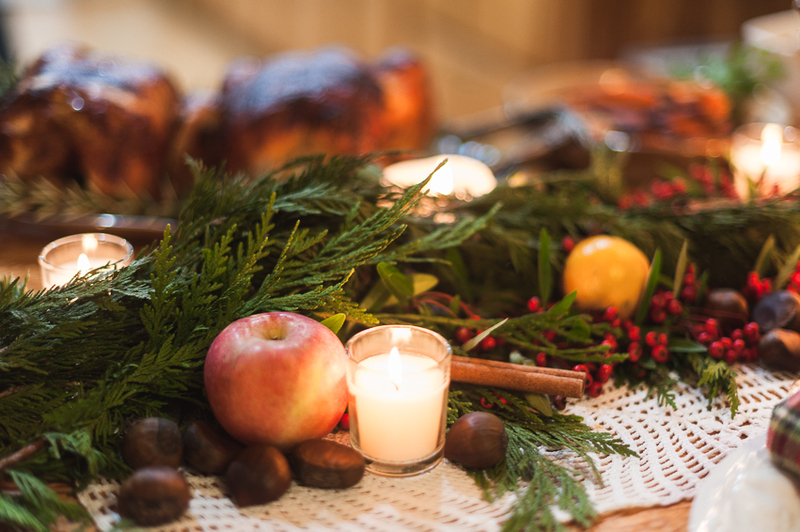 This holiday season is often so busy, but we are so glad to have carved out time for this. It's moments like these, coming together and slowing down to appreciate a story as heartwarming as this, that made us feel like this is what the Christmas season is all about. We hope you were able to slow down and really soak in the holiday spirit with those you love. Happy holidays! It's #bannedbooksweek, and that means we spend a week calling attention to how harmful censorship is and celebrating the right to read! We have been participating in a local Banned Books Club for the better part of a year now, so we just wanted to let you all take a peek into what a Banned Books Club looks like, and why we appreciate it so much in our reading lives! Imagine this: it's mid-month, 7pm, and you're walking into a local bar/restaurant, passing the din of the main dining area and heading straight into the back room. Other members have begun to congregate, and are ordering up drinks or some snacks to fuel the next hour of conversation. It's a relaxed, amiable scene; almost dinner party-ish, with books and pint glasses littering the pushed together tables. This room contains an exceptionally eclectic mix of people from all walks of life. We have fresh from college newbies, aging writers, and literally everything in between. That kind of diversity is sincerely one of the best parts about going to any book club. Suddenly you find yourself talking to someone quite different than you about politics or careers, or hobbies, or whatever else, and the perspective shift is often such a good reminder that so many different humans and points of view exist in the world. Once everyone gets settled in, we get straight to the book. This book club easily has the broadest range of novels I've ever come across. We've read everything from YA graphic novels, to classics, to fantasy, to contemporary fiction. Members often say that's what they love about it; how broad the selections always are, and being pushed to read things they might not otherwise have picked up. It's also proof that books across all genres get challenged. Most of us who are avid readers tend to stay in our "wheelhouse" right? We tend to know what we like, and we keep picking up the same kinds of books looking for that brand of experience. Being forced out of that has been really, really good for us. 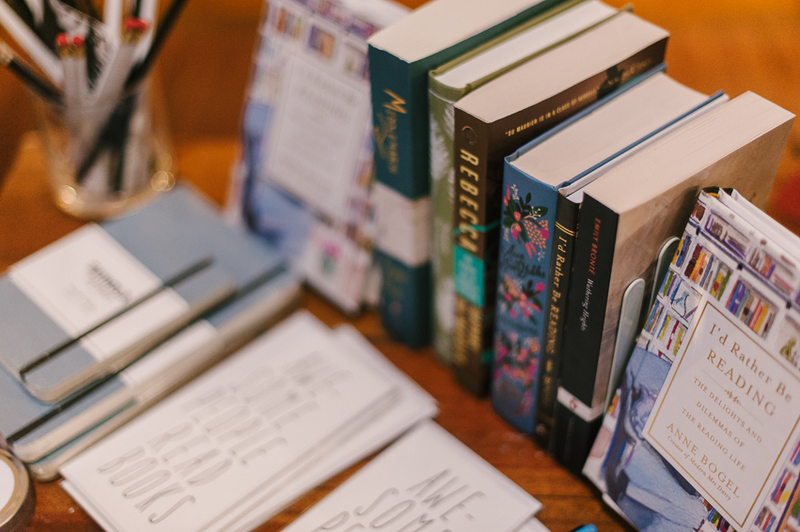 We've read more diversely, we've read genres we would have never delved into, and basically cracked open our reading lives and let all kinds of new books open the door for us to explore literature with a wider scope. One of the first things we talk about in the meeting is WHY the book was banned. The reason has ranged from premarital co-habitation to failed seduction attempts by a teenager to illustrations that were "too graphic". This tends to lead to in-depth discussions about whether we thought a book was appropriate in schools, or whether the book made us uncomfortable or not. Sometimes its good to be uncomfortable. Sometimes its good to take a hard look at the reason why something makes you uncomfortable, and to challenge your world view and deeply rooted belief systems. It often shocks me what amazing, important works get banned over something like homosexual undertones, or drug use, or what have you. It's reductionist. It takes a work of literature that presents something valuable to the world, and tries to reduce it into something "bad" based on one component, often even from one persons distaste/personal opinion, and it tries to silence the whole experience. I can't imagine being so consumed with the feeling that a subject I personally deemed "wrong" should never see the light of day that I would attempt to just blot out the entire work for everyone else, but it has happened. It is happening. It will continue to happen. And that's scary. Honestly, I feel like that narrow, reactionary line of thinking, and willingness to infringe upon other people's intellectual freedom is so much more dangerous than any of the themes or subjects presented in these books could possibly be. The people in this club tend to agree. Everyone in the room is here because they are against censorship, against silencing taboo topics or alternate world views, and very much against imposing limits on people's abilities to choose for themselves. We discuss the books that have been "challenged" to form our own opinions on it, not to have one made for us. In the end, discussion tapers off, checks are brought, and our next read is chosen, before people scatter back out into the evening. It strikes me that everything about this book club is about perspective shifts. It's about looking at the world in new ways through books, through people, and through the beautiful mingling of the two. 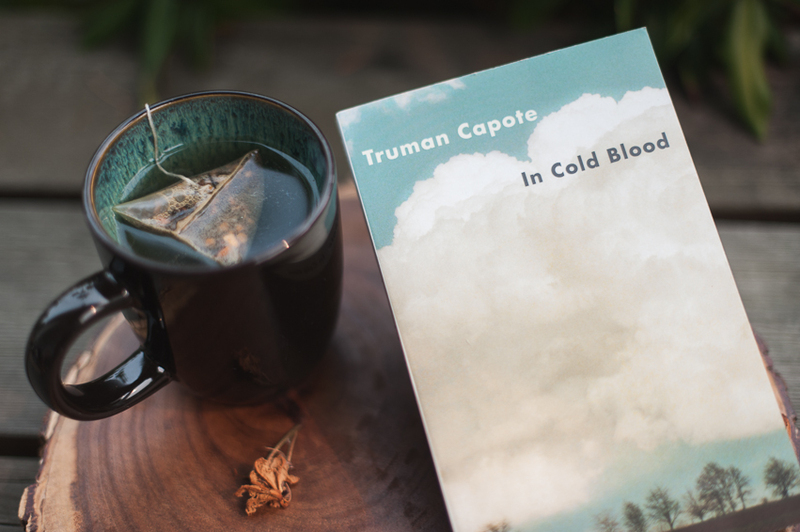 Would you consider joining or starting a banned books club? Does the concept appeal to you? Let us know!